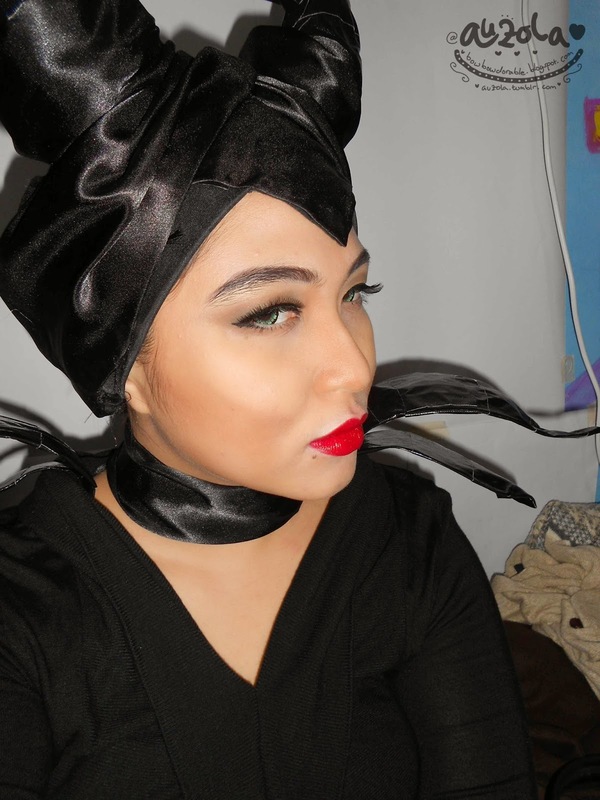 JUST WATCH MALEFICENT MOVIE TODAY! It was awesome, except i dont like that Aurora played by Elle Fanning, she's pretty and sweet, but Aurora looks elegant and mature, so she's not the perfect Aurora. 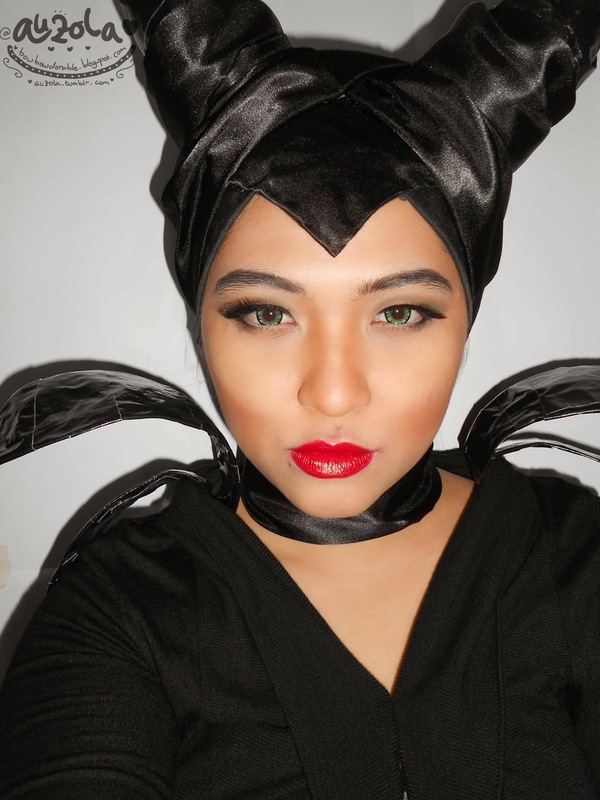 But Jolie played Maleficent so well! So while im on it (read: not lazy and have an inspiration to write), im also going to post my latest look! Mwahahaha, yes, I am mistress of all evil! 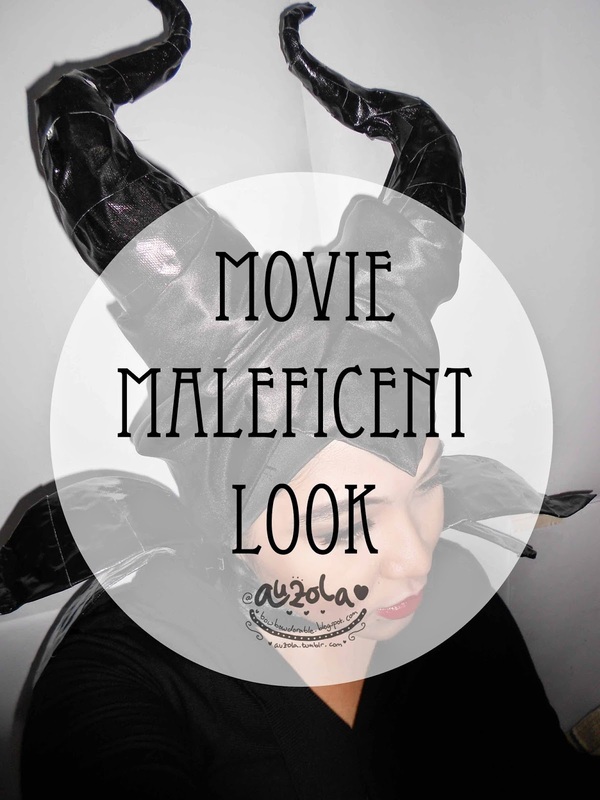 Im Malefient! I hate the contour i made and i hate my contact lens color! It's all that i got unfortunately. I only have one green contacts, and it was actually for Rapunzel since i thought the wig is gonna come first, but it somehow lost in the mail. I hate indonesia post seriously, they kept on loosing my package! Thank god i got my refund though. 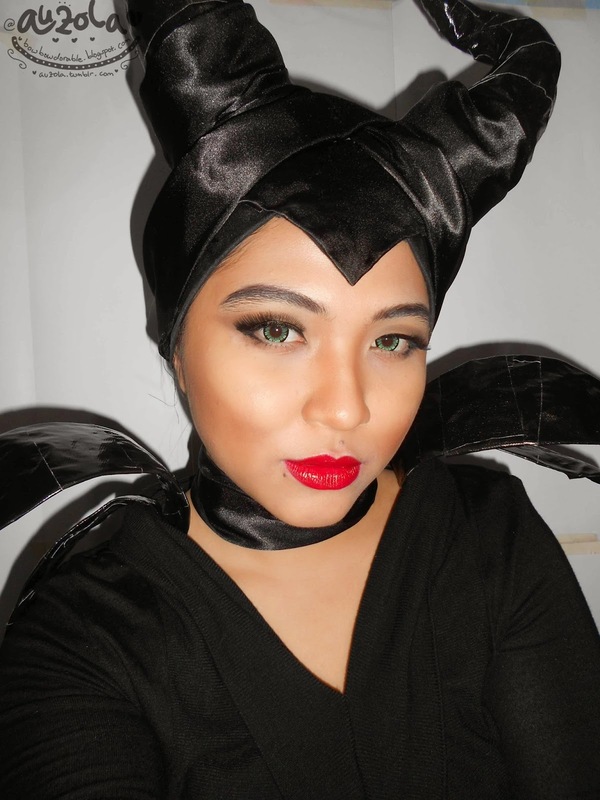 So with minimum brain cells connected and wrong shade of contacts, i still manage to do Maleficent makeup, even it's not great hahaha. And no tutorial, nada, not a bit. 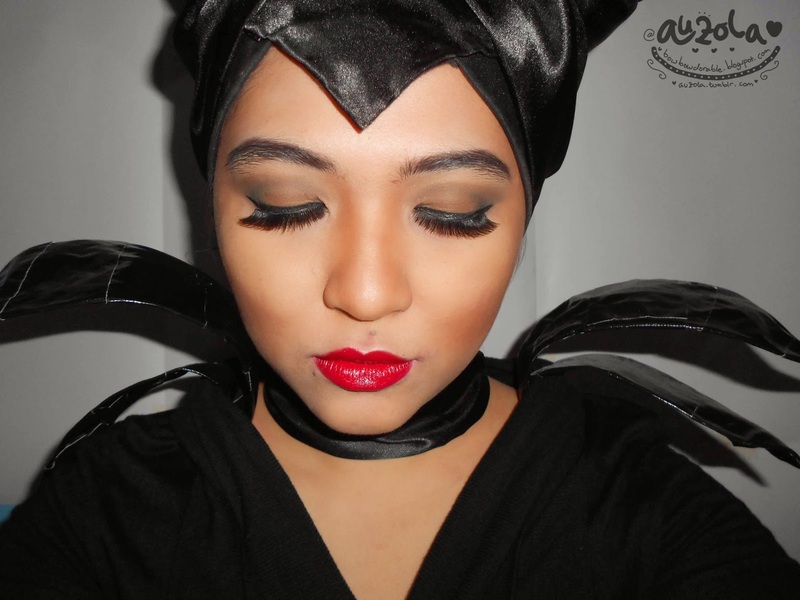 Hehehe, so it's just like sharing pictures of my Maleficent looks, i hope you dont mind seeing my narcissism. Mwahahha *evil laugh*. Anyway i made the horn by myself, i used duct tape, something like beanie, plastic glasses, aluminium foil, and wire. Im sorry i have no tutorial as well for it, but im planning on making one more, so i hope i have time to take picture of the process. 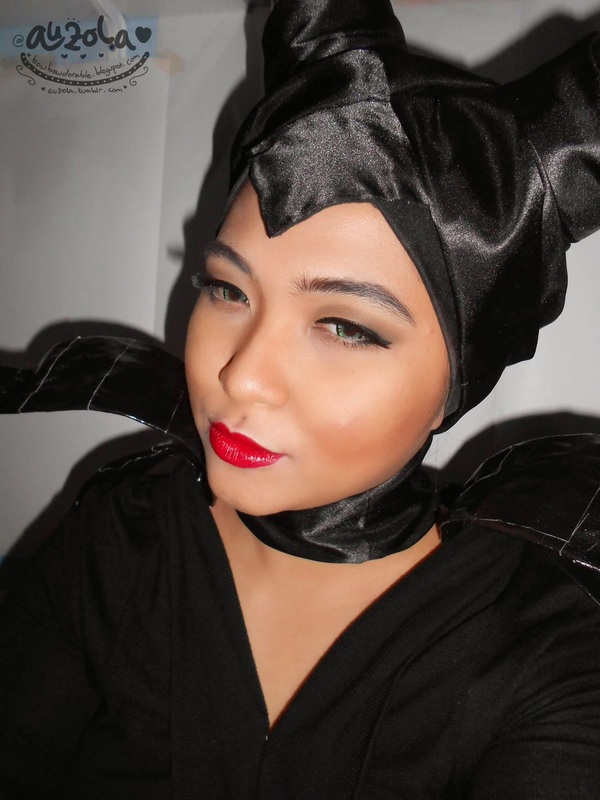 As for the costume, i have none as well, so i used one of my black blouse and i secured it with pin so it looked like Maleficent robe. And to add the effect, i made those silly neck wings hahaha, idk what to call it. Anyway i made it from wire, aluminium foil and duct tape and i secure it on my shoulder under the dress using duct tape, dont worry it's not hurt. 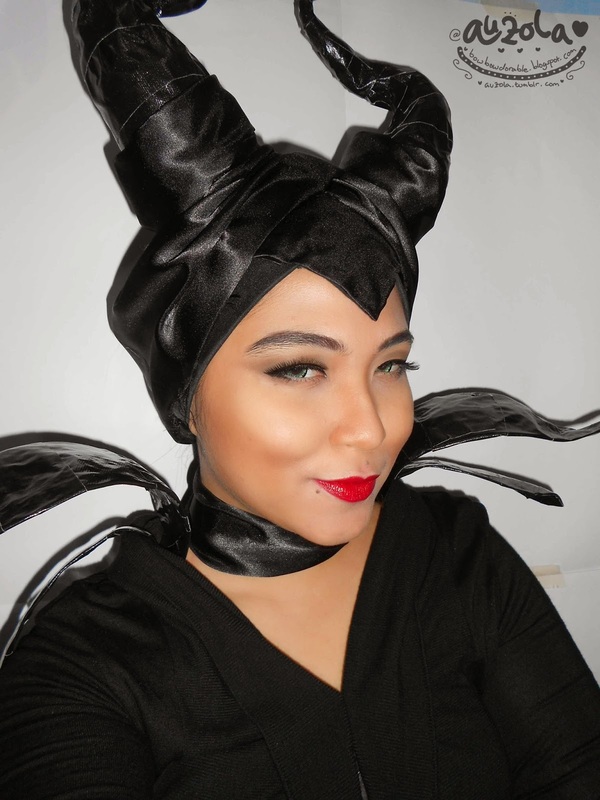 Hahhaa, now i have the urge to make Maleficent robe even though i still have like 5 dresses on my wish list to be made (i had the fabric already! ), so it gonna be on my waiting list as well! "But if i know you, i know what you'll do. You love me at once, the way you did once upon a dream~"
Thats a wrap! I hope i can make a better version next time! And also with a better outfit or at least a better horn because this one is so messed up! Hahhaa, thanks for stopping by! hey dear, seperti yang uda aku mention diatas mengenai pakaian yg aku pakai, itu sbnrnya bukan kostum. 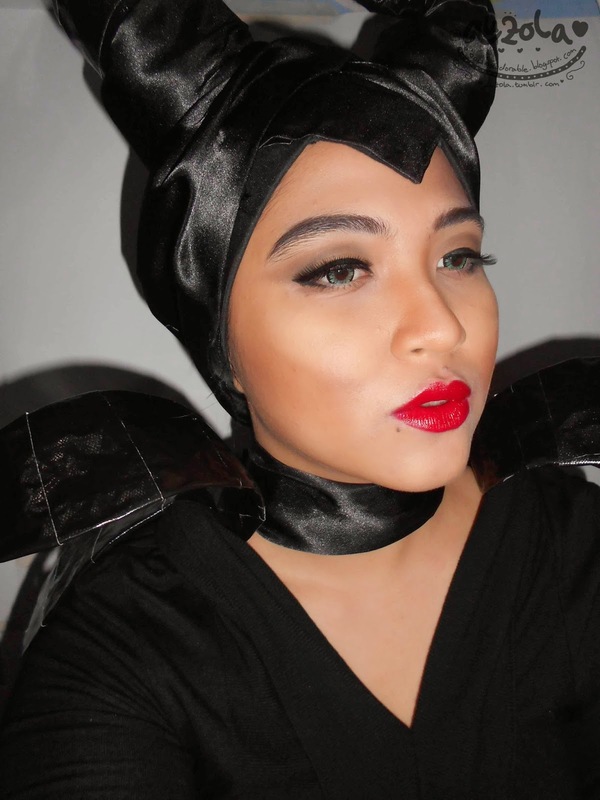 Cuma baju yg kebetulan memiliki belahan sama kaya depannya kostum Maleficent dan ditambah handmade sayap2an yg di jubahnya itu dibuat dari kawat, alumunium foil dan duct tape hitam. Kalau mau mungkin bisa di buat ke tukang jahit krn aku kurang tau kalo beli kostum begini di Indo dimana atau kalo mau dr luar bisa coba cek ke etsy.com (tapi mungkin harga bisa more than $100), atau coba ebay mungkin bs lebih murah.